(Note: reprinted from Woodworking Network). Arkansas Wood Doors, a maker of cabinet doors, has expanded its CNC capability to offer a complete RTA cabinet system. “A trend has been taking place among many small- to medium-sized cabinet shops, especially those shops without CNC equipment, and that is to compare the fixed price of our cabinet box to their best estimate of what it actually cost them to manufacture a similar box on their shop floor,” said John Allan of Arkansas Wood Doors. Allan said in many cases this change is from a new generation that has been working on the shop floor and is now beginning to take on more responsibility in the overall management of the business. AWD’s first RTA cabinet system was actually designed and introduced in 2000 and was offered for about two years. “At the time it was very difficult to generate much interest in the system, although we were successful with builders,” Allan said. “In 2015 I began the process of updating our original Stonehenge Cabinet program and my first priority was updating our CNC equipment. 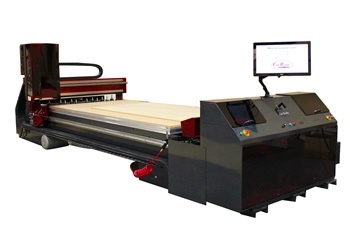 The Thermwood Cut Ready Cut Center is designed to be an alternative to traditional CNC routers for making cabinets, closets, furniture, doors and drawers. It can be operated as a traditional CNC router, running programs generated by different types of CNC software, or it can be switched between operating as a CNC router and operating as a Cut Center. “We see an opportunity in the custom cabinet market to increase the overall value of our door sales via offering the custom cabinet components with the software and equipment that we have invested in,” Allan said. “Offering a pre-finish option to both our door and cabinet orders has also increased the overall value to more jobs as customers get more comfortable with receiving a pre-finished product. Arkansas Wood Doors partnered with KCD to put AWD’s door abilities into their software, and AWD worked with KCD on their most recent Version 10 software. When a cabinet shop uses KCD and they order doors out they can choose that option in KCD. It converts into AWD’s profiles and the order will come to AWD from KCD. The customer is also able to send their cabinet order from KCD to AWD. Allan said KCD is the one he would choose, even if they didn’t have that relationship. AWD rents KCD’s door program with an option to buy, instead of spending $10,000 at another company and finding the software program really isn’t what they want. 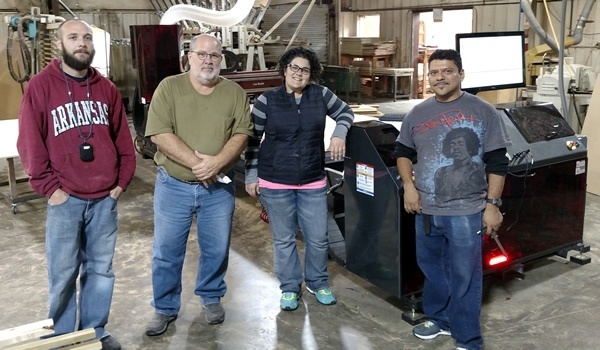 AWD makes veneer raised panel doors with a ½-inch MDF core and then wood veneer is applied to both sides with two membrane presses, a Shaw Almex press and the most recent press that was custom made in Kansas by Schuetz Tool. Use of this style of raised panel compared to traditional solid wood raised panel offers many advantages, most importantly a substantial cost savings. In addition to wood doors, AWD also offers thermo-foil (RTF) style doors and slab style doors with option of veneer, melamine, and the new textured wood grain materials with matching edge band. Allan said that Adams Face and Veneer supplies veneer in stock sizes and custom sizes for larger jobs. AWD can also cut veneer to size on site. When pressing veneer on to a raised panel, Allan said the main secret is to use a specific glue, and that glue has to reach 200F. As long as you get to that temperature, it will not delaminate, the veneer will not separate from the substrate. “There are a lot of little nuances, but once you get them right, you don’t change the process,” he said. Cabinet door frames can be most any wood species including several options for paint grade doors. Ripped lumber goes through a Leadermac 623 Platinum moulder, which is creating the profiles. Boards are then fed through an Omga GT 2005 OPT cutoff saw and optimizer that cuts pieces of clean lumber. Later, two PMK tenoners cut mortise and tenon joints in wood parts, and a Balestrini CNC miter machine is used for miter joints. A Voorwood A125 shaper-sander is applying the profile and then sanding it. A Timesavers 2300 widebelt sander is sanding wood parts. Door parts are then assembled, and a Door Master clamp carrier is used. A Felder G360 edgebander is being used to edgeband cabinet parts. AWD is finishing about 10 percent of doors and 50 percent of cabinets, but this percentage is growing. They use M.L. Campbell finishing products and can match custom colors. Allan said that paint-grade shaker is the most common door style. During a recent visit they were doing four different shades of white. In those cases, they are painting the MDF core and the wood frame. All cabinet components and doors are shipped out flat packed, including cabinet doors, closets, wall storage, drawer boxes, louvered doors, and thermofoiled doors. Many customers still want face frame cabinets, even when shown the advantages of frameless. 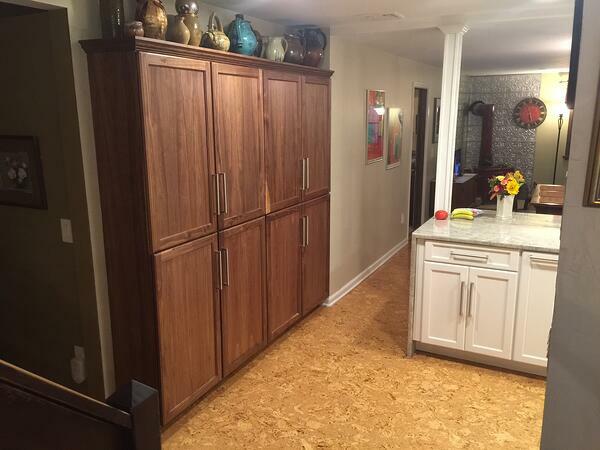 “Our core customer is still the custom cabinet shop but over the past several years we have seen an increase in companies that specialize in cabinet reface/remodeling, and contractors looking to buy direct from a manufacturer. “I am seeing the traditional cabinet shop that we have been supplying since our start in 1977, and with the new generation taking over the operation, the younger generation is more acceptable to outsourcing more than just doors,” Allan said. AWD makes veneer raised panel doors with a ½-inch MDF core and then wood veneer is applied to both sides, right, with two membrane presses. 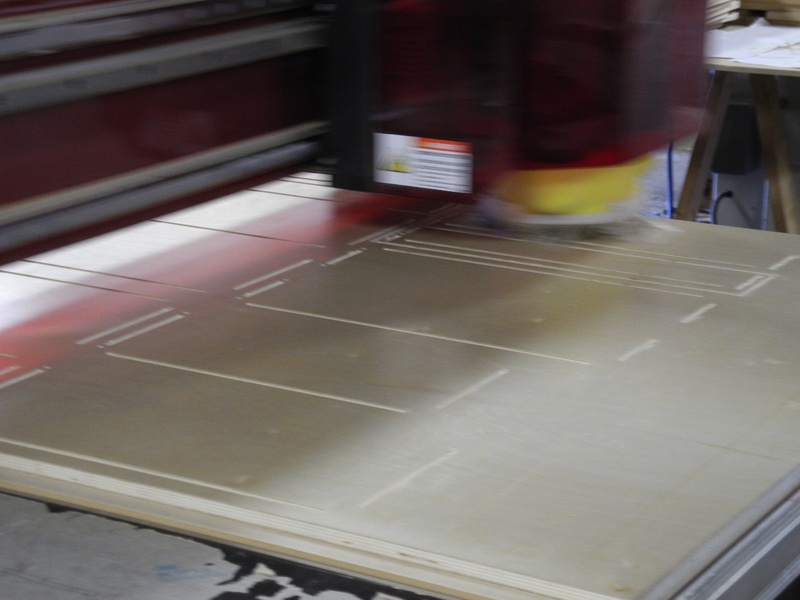 The Cut Center can be operated as a traditional CNC router, running programs generated by different types of CNC software. 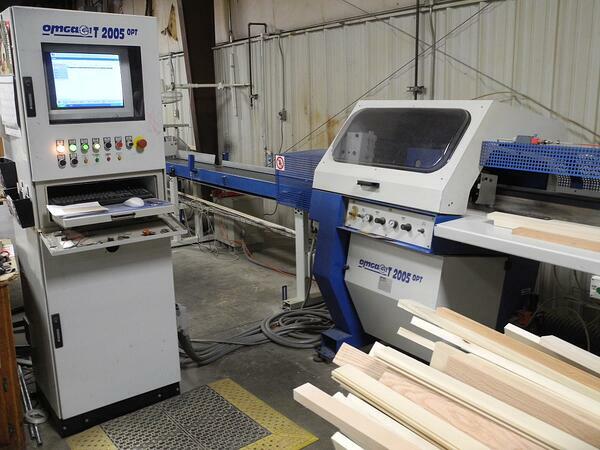 Arkansas Wood Doors has expanded its CNC capability to offer a complete RTA cabinet system. Boards are fed through an Omga GT 2005 OPT cutoff saw and optimizer that cuts pieces of clean lumber. 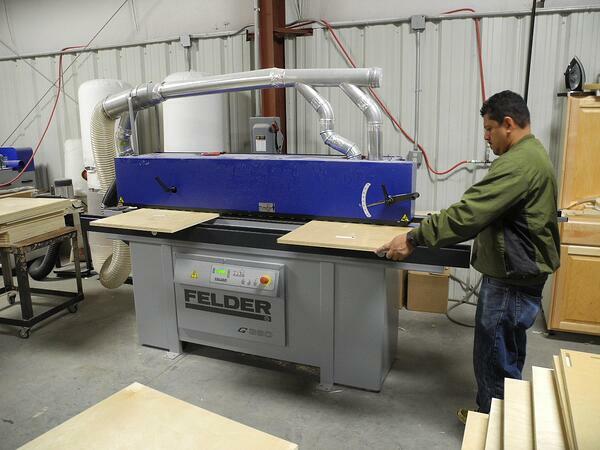 A Felder G360 edgebander is being used to edgeband cabinet parts.